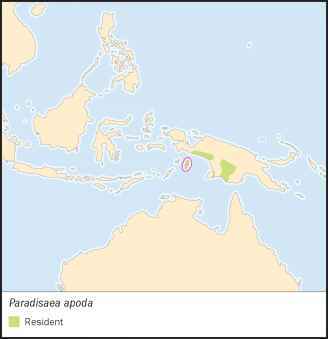 Paradisaea apoda Linnaeus, 1758, India = Aru Islands of Indonesia. Two subspecies. English: Great bird of paradise; French: Paradisier grand-émeraude; German: Gottervogel; Spanish: Ave del Paraíso Grande. 13.8-16.9 in (35-43 cm); female 0.37-0.38 lb (170-173 g), male (no weights avialable). The largest of the plumed birds of paradise. Forehead to nape a pale orange-yellow. Forecrown, lores, ear coverts, chin, and throat have fine, iridescent yellowish green feathers. Dark brown ruffled feathers form a breast cushion; brownish upperparts, tail, and abdomen. Bright yellow elongated flank plumes fade to whitish with beige tips. Bill is pale bluish gray. 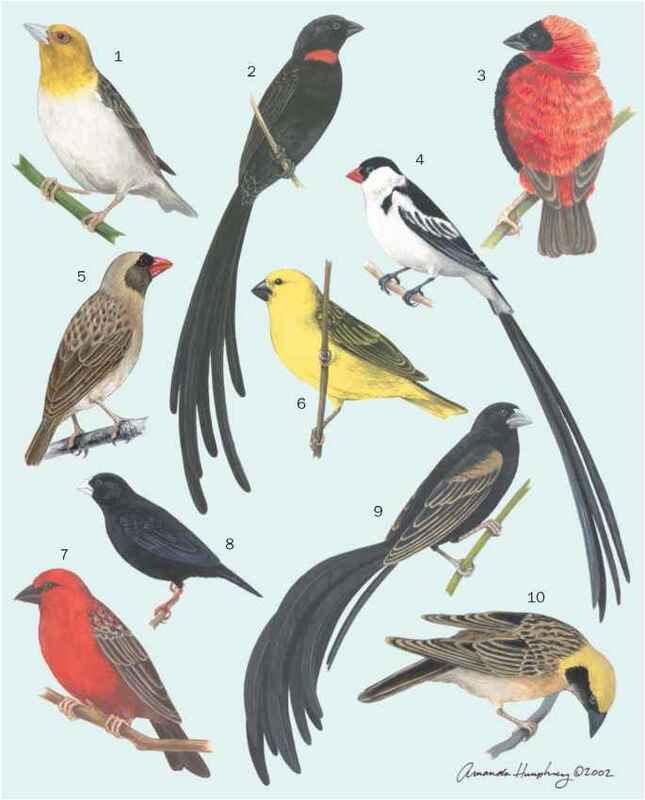 Females drab brown in color and lack long feathers. The south of the western half of the New Guinea mainland, excluding the western peninsulas, and the Aru Islands. Lowlands to about 3,300 ft (1,000 m) altitude. P. a. apoda: Aru Islands of Irian Jaya, Indonesia; P. a. novaeguineae : southern New Guinea from Timika, Irian Jaya, eastward to the Fly/Strickland Rivers watershed, western Papua New Guinea. Males remove foliage from lek perches. Males are highly vocal and perform animated flank plumage manipulations, body postures, and movements about lek perches in courtship display. The most common lek advertisement song consists of repeated loud, deep, wauk or wonk notes. Actively animated in foraging. Eats fruits and animals (mostly arthropods). Polygynous, with intensely lekking and promiscuous adult males forming loudly vocal aggregations at traditional display trees. Breeding during at least August through December, March, and May. Known clutches are all of one egg. Incubation and nestling periods unknown. Sufficiently widespread and common to be of no concern as a species, but some local populations have declined.